The restoration of a 1967 Renault 4 modified with a R5 Gordini engine and 5 speed gearbox. And you thought you were daft! Frederick the frog demonstrates how to fix common R4 problems, and how to maintain your Renault. What to look for in a Renault 4, how much to pay, and what they are like to drive. Also a little about history and how to find spare parts. 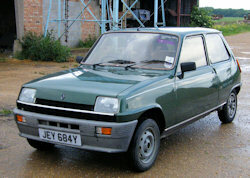 The MK1 Renault 5 was the world's first supermini. It was largely based on the greasy bits from the Renault 4 but had a smaller and lighter body. Rare now so worth restoring. My Renaults from a TL to an F6 van, many GTLs, and even an elderly 4L. Features the restoration of Ermintrude the GTL and her tour of Europe. Lucie owned a Citroen 2cv before her Renault 4. She drove it across North Africa and the Sahara desert. Save money on Renault 4 repairs by buying a MIG welder and doing your own welding. The MIG welding website includes a tutorial complete with videos. Completely standard road going Renault 4s racing against Citroen 2CVs at Santa Pod. This site was written by a cloth cat called Clementine. While it might be fun to see a stuffed cat puppet in court, if you believe anything she has to say you should really be thinking about suing your psychiatrist.